The Warwick Fabrics,‘Bianca’ is a stunning fabric design. 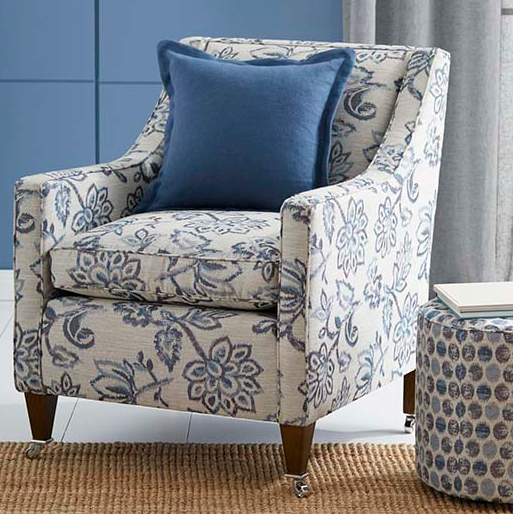 The Bianca design is available in six colour ways and this stylish armchair has been upholstered in the ‘Ocean’ colour way. The coordinating Ottoman has been upholstered in ‘Bessie’ design. While having your armchair reupholstered you may like to have a coordinating scatter cushion made to order. Warwick Fabrics offer a fabric swatch service where a small fabric sample is sent to you allowing you to see how the fabric will look in your home. There are so many variables that affect how a fabric will look in a room such as the brightness or otherwise of natural light, the paint colour on the walls, floor coverings and other decors. So, it is important to see the fabric in your home. This gives you the assurance you have made the right decision and will love the furniture with its new upholstery. Please contact us for a quote to have your armchair reupholstered in quality Warwick Fabrics.